The Kansas City Royals super fan is back in Kansas City. Sung Woo Lee has flown back into town to walk the red carpet for the screening of his big film debut. Sung Woo, a lifelong fan from South Korea, is the subject of the new ESPN "30 for 30" short film #BringBackSungWoo. 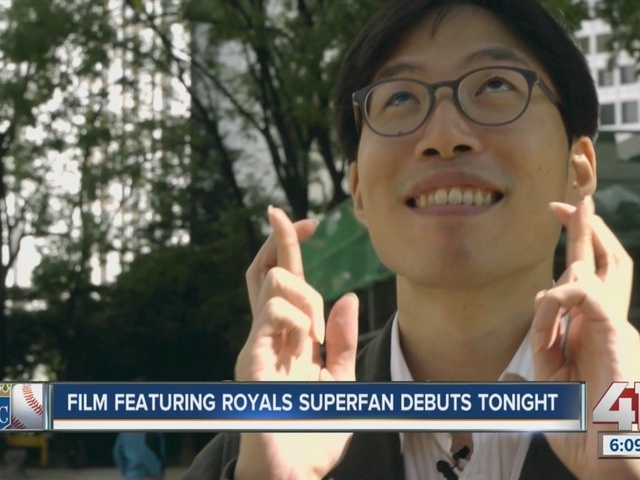 Sung Woo had watched his favorite baseball team for years from his home country and then connected online with fans in the U.S.
Kansas City embraced Lee when he first visited just before the playoffs in August 2014. The film also features the documentarian Josh Swade as well and his effort to bring Sung Woo back to Kansas City during the playoffs. "He's part of our Kansas City family. People here love him and he's got like really close friends here and it's all super genuine, there's no faking it. The guy is a huge fan and he follows the Royals religiously," Swade said. The #BringBackSungWoo film debuts on Monday at 7 p.m. at Union Station and on espn.com on Oct. 7. Amy Hawley can be reached at amy.hawley@kshb.com .